Home Business Here's the best Answer "How often should I write Blog post." Here's the best Answer "How often should I write Blog post." One of the questions I get often from clients is, how often should I blog? Though that's the question I get, the underlying issue is really, what do I need to do in order to make my blog effective as a marketing tool. If it's not effective, you might as well put your time and energy elsewhere. To answer the question, I'm going to distill down the research. Overall, more is better when it comes to blogging. According to Forbes, companies that market to other businesses and publish 16-plus blog posts per month get 3.5 times more traffic than companies that publish only 0-4 posts per month. Keep in mind: website traffic does not equal conversions. You're not going to sell to every single visitor to your blog. Marketing is more of an accumulation of contacts over time. If they are high-value contacts, like great content, you're more likely to have someone buy. The other thing to consider is that not all blog posts are created equal: 90% of blog leads come from older posts. So it makes sense to build your library of blog posts as quickly as you reasonably can. Once you hit 400 posts, you'll see a significant spike in traffic. If you post four times a week for 6 and a half months, you'll hit that threshold. There's a SEO bonus too to frequent blogging: the more often you refresh your website, the better you'll tend to do in your page ranking in a Google search. That said, posting a blog 16 times a month, 4 times a week, is a significant commitment. So let's move from looking at optimal to minimum, to give you a starting point. As a general guideline, posting on your blog should happen at least once a week. Think about it from the perspective of your audience. Staying within people's awareness is important. It's important for visibility, and it's also important for building a brand story, one that people understand and relate to. Once a week is about the minimum you need to stay on their radar. If you're considering ramping that up, here are some things to take into account. You may have seen stories about bloggers who post every day, or even more than once a day. That can work well for you if you're using multiple platforms to broadcast your posts. Blogging platforms like Medium love more content, and each time you post, you have the opportunity to reach a new audience. For your email list, though, sending notifications of a new post every day can result in unsubscribes. You don't want to deluge your list. If you do post more often, consider spreading the word in less frequent emails as a compilation, or through social media or other channels. That said, back in 2013, the hugely popular Huffington Post blog was publishing a new post every 58 seconds. That's 1600-2000 posts a day. Of course, they have many contributors. It's totally out of the realm of aspiration of small business owners, and doesn't make sense for many businesses. But it does illustrate a point. Find out what your audience wants. Your ideal audience's desires are ultimately what you need to know in order to determine the best frequency to use for your blog posts. To find out, you'll have to do some experimenting and measuring. Popular blogs do analyze their metrics, in rigorous detail. That's true of all effective online marketers. Test different frequencies of posts. Use Google Analytics or another online tool to determine your email open rates when you notify your list of blog posts. Track your blog post views. This tracking has the added benefit of learning which topics that interest your audience the most. Provide more content on those topics, so you're always providing great value. An equally important consideration in your blogging frequency is consistency. Consistency is essential to effective marketing. People buy from those they know, like, and trust. To create trust online or offline, you have to show up when you say you're going to. So whatever the frequency you decide to put your blog content in front of your prospects and clients, make it a schedule you can stick to consistently. It's better to ramp up to that once a week minimum than to post once a week for a couple of weeks and then disappear for a month. While you may be taking a break, your marketing doesn't have to. You can write and schedule everything in advance. In fact, disappearing off the scene for a time is something you should think carefully about. Remember trust? Your prospects and clients have lives and businesses that continue even when you're on vacation. Stay in their awareness by scheduling blog posts ahead of time. When I say ahead of time, I mean prepare your content at least 6 weeks in advance. Six weeks of content lets you be strategic about the content you're offering. Being strategic is a challenge for many small business owners, but it makes all the difference. Being smart about what your topics are helped to shape how your audience perceives you and your brand. Leading up to the launch of new offering? You can steer your content in a direction that supports that. For those of you with the more reactive, 'when I feel like it' approach to online content, planning 6 weeks in advance can be pretty scary. This is where self-discipline comes in. In order to get the results you want, you'll have to commit to doing what it takes. Whatever frequency of blogging you use, make sure your content is high value. All the metrics and juggling of scheduling you could do is pointless if readers aren't engaged and getting value from what you provide. Decisions about frequency of blog posts all center around the question, what frequency will result in my blog being most effective as a content marketing tool? Start with a once a week minimum, and then experiment with what's right for your audience. 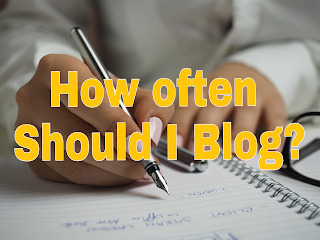 I hope your question on "how often should I Blog is clear.."
Now let us know how often you are going to blog ? Below in the comments..